EndNote. What is EndNote:  EndNote is referencing software that enables you to create a database of references from your readings. Your database of references. 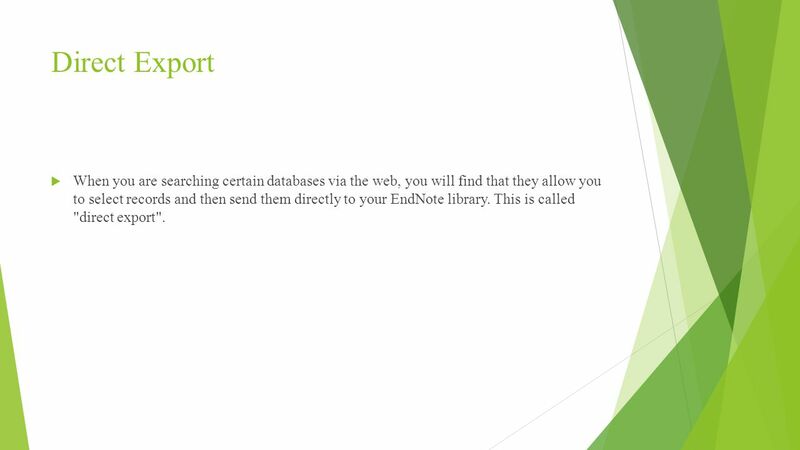 2 What is EndNote:  EndNote is referencing software that enables you to create a database of references from your readings. 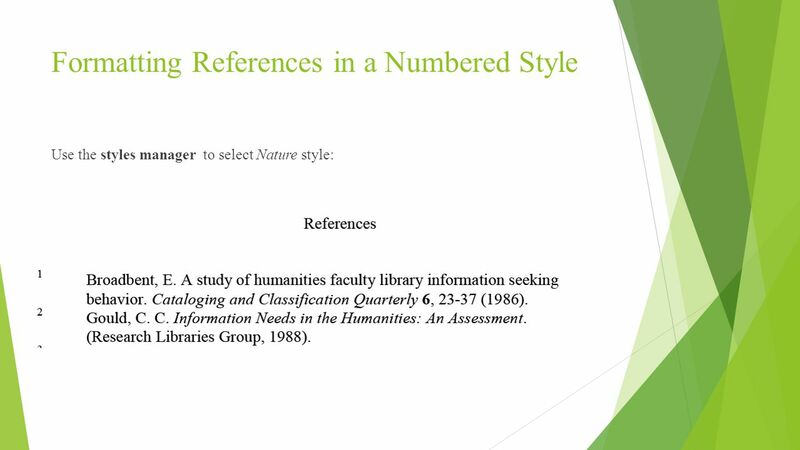 Your database of references can be organised, edited and converted into a formatted bibliography in many different styles, such as Harvard, APA, or Vancouver. 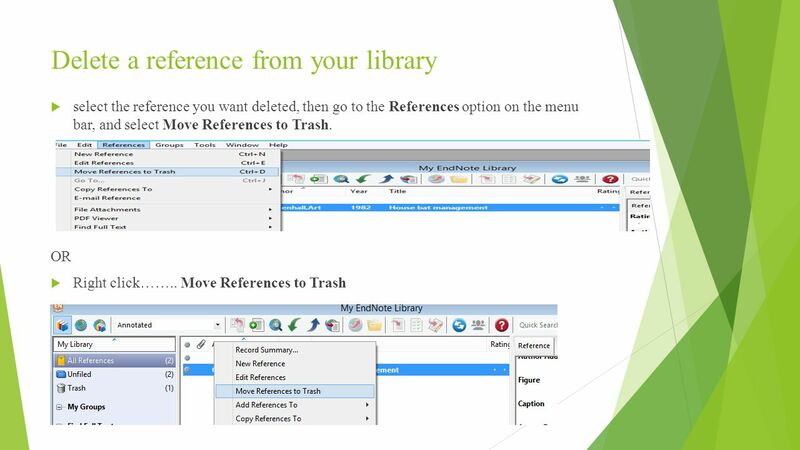 These references can be automatically inserted into your documents. 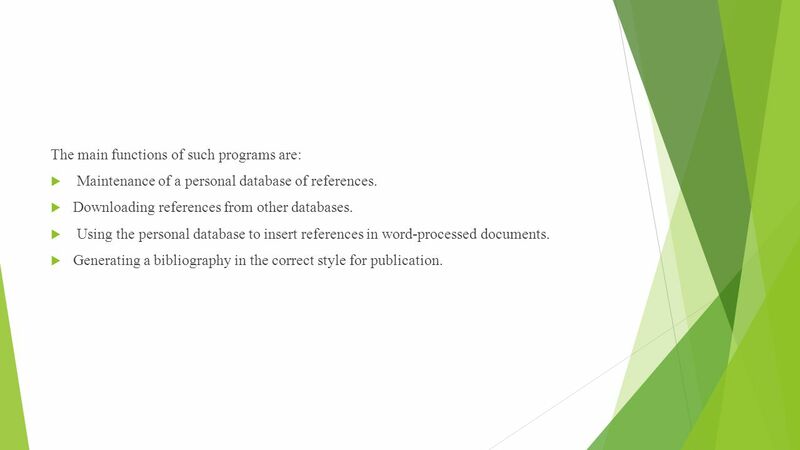 3 The main functions of such programs are:  Maintenance of a personal database of references.  Downloading references from other databases.  Using the personal database to insert references in word-processed documents.  Generating a bibliography in the correct style for publication. 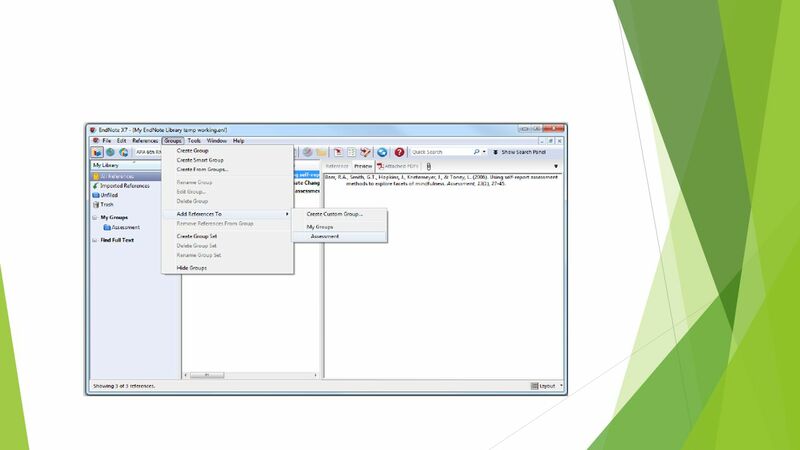 4 Opening EndNote To create a new library:  File menu / New / Enter a name to identify your new library To open an exiting library:  File menu / Open library. 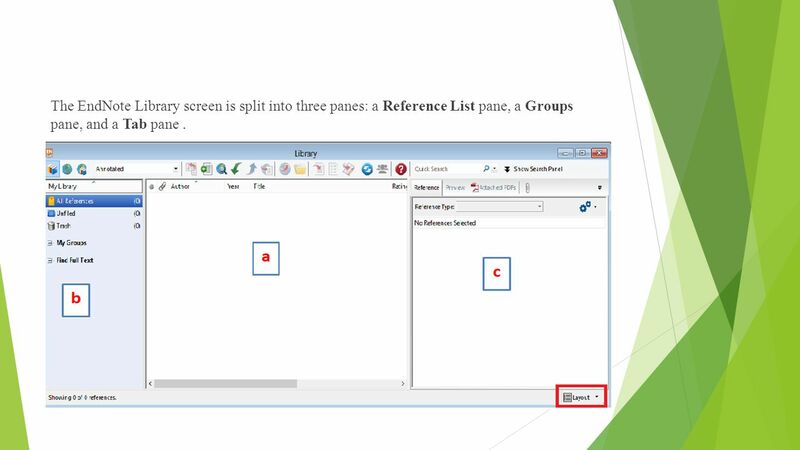 5 The EndNote Library screen is split into three panes: a Reference List pane, a Groups pane, and a Tab pane. 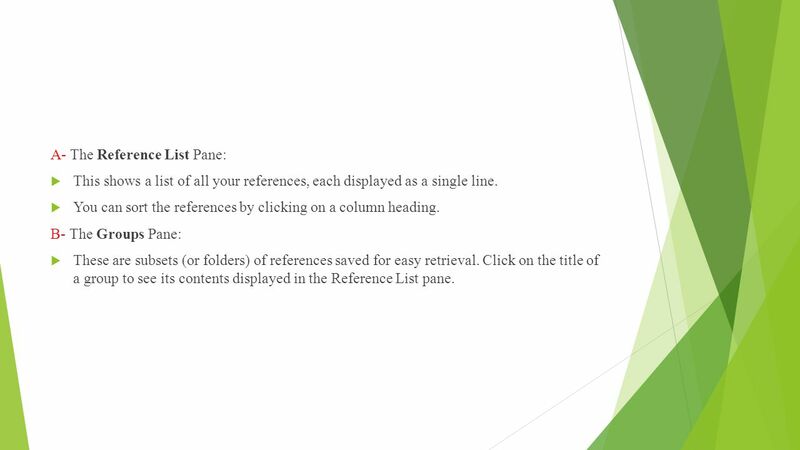 6 A- The Reference List Pane:  This shows a list of all your references, each displayed as a single line.  You can sort the references by clicking on a column heading. B- The Groups Pane:  These are subsets (or folders) of references saved for easy retrieval. Click on the title of a group to see its contents displayed in the Reference List pane. 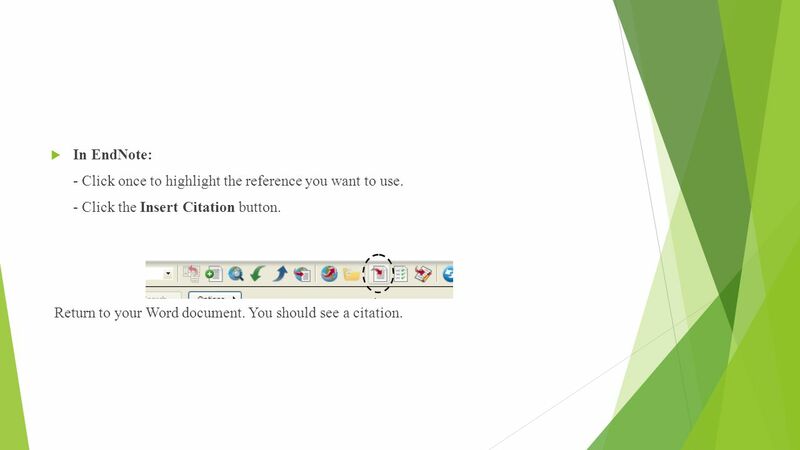 7 C- Tabs Panel displays:  A Reference tab for editing a reference  A Preview tab for viewing formatted references  An Attached PDFs tab for viewing PDF files  A paper clip icon for attaching files to a reference We can change the layout by click the layout button and select what you need. 8 More about EndNote libraries  The file extension.enl stands for EndNote Library. A library is just a file like any other file. It can be copied, renamed, deleted, moved to another folder or compressed.  When EndNote creates the library, it will also create a.DATA folder which contains various files connected with the library. 10 Author & editor names  If there is more than one author, each author must be entered on a separate line. (Use Enter button to start new line).  Personal authors & editor - Author names should be entered with the last name followed by a comma and the first name (or initials), e.g. Smith, John. - You must type capital letters where required, e.g. Smith, John (not smith, john).  When entering corporate authors (companies, institutions, organizations, etc. 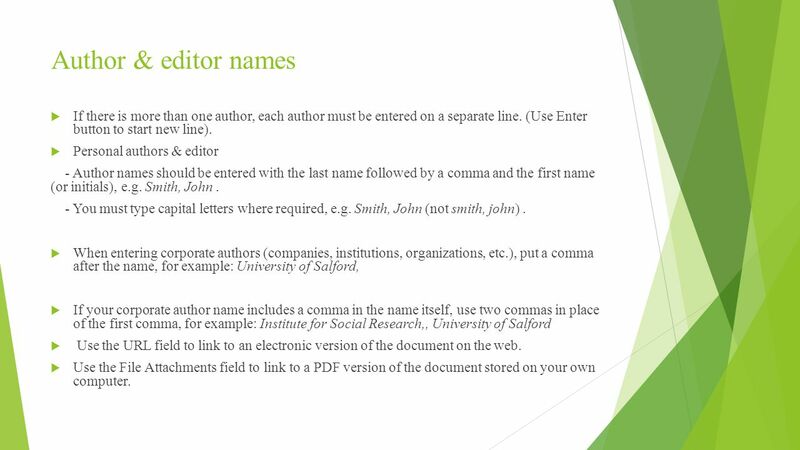 ), put a comma after the name, for example: University of Salford,  If your corporate author name includes a comma in the name itself, use two commas in place of the first comma, for example: Institute for Social Research,, University of Salford  Use the URL field to link to an electronic version of the document on the web.  Use the File Attachments field to link to a PDF version of the document stored on your own computer. 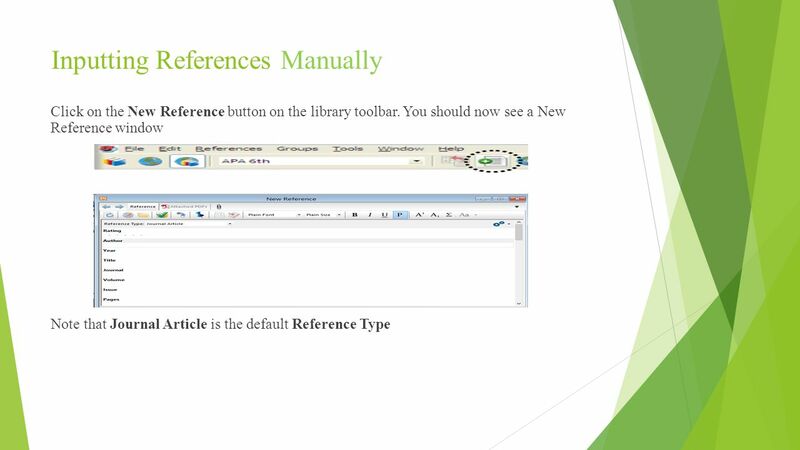 12 Editing References  In the library window, double-click on one of the references that you have entered.  highlight the reference you would like to edit. 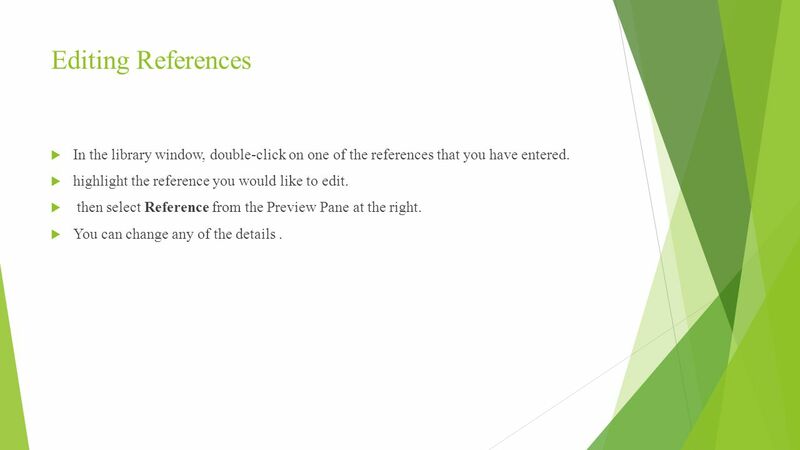  then select Reference from the Preview Pane at the right.  You can change any of the details. 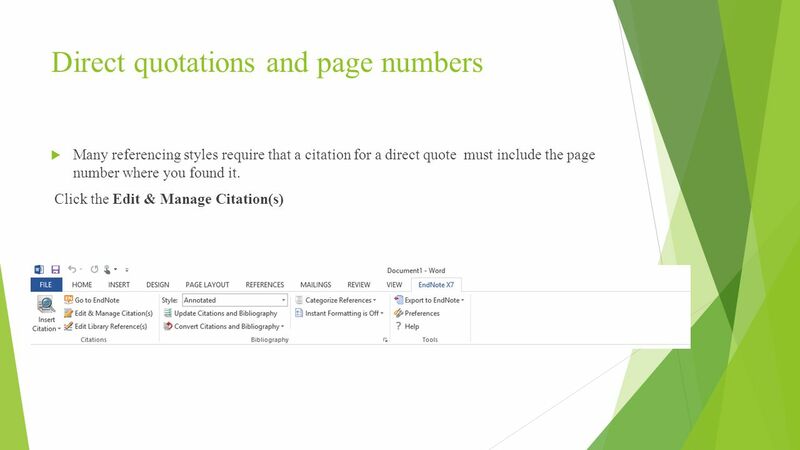 14 Output Styles  An EndNote output style is a piece of software that will convert the data in your library into formatted references that correspond to the bibliographical styles used by journal publishers or specified in style manuals. 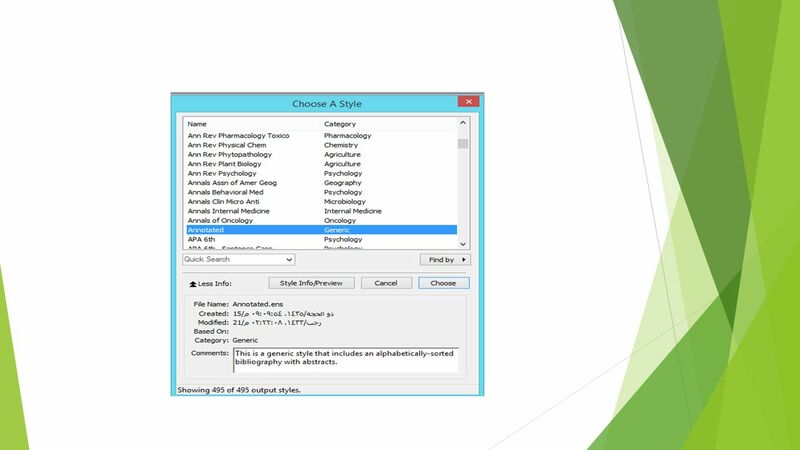  A range of output styles is supplied with the software, and hundreds more styles can be downloaded from the EndNote website, so there is a good chance that you will find one suitable for your needs. 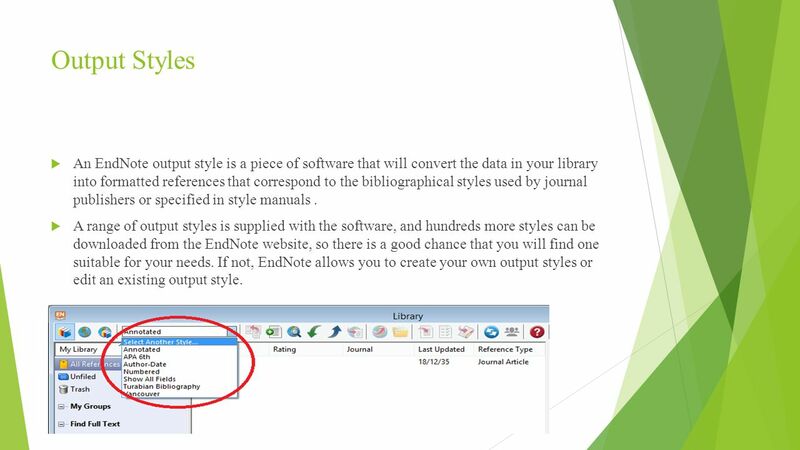 If not, EndNote allows you to create your own output styles or edit an existing output style. 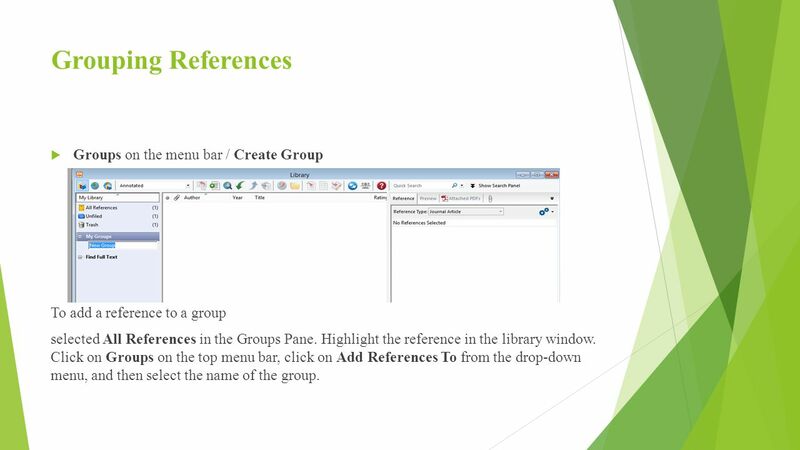 16 Grouping References  Groups on the menu bar / Create Group To add a reference to a group selected All References in the Groups Pane. Highlight the reference in the library window. Click on Groups on the top menu bar, click on Add References To from the drop-down menu, and then select the name of the group. 18 Direct Export  When you are searching certain databases via the web, you will find that they allow you to select records and then send them directly to your EndNote library. This is called "direct export". 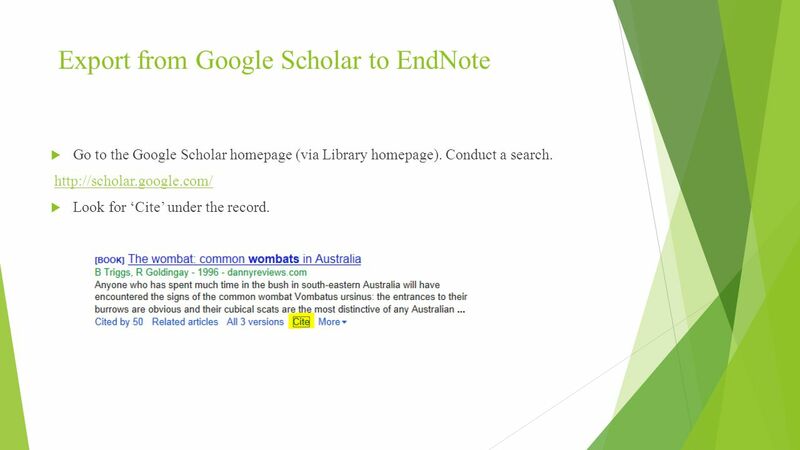 19 Export from Google Scholar to EndNote  Go to the Google Scholar homepage (via Library homepage). Conduct a search. http://scholar.google.com/  Look for ‘Cite’ under the record. 20  Now Import into Endenote. 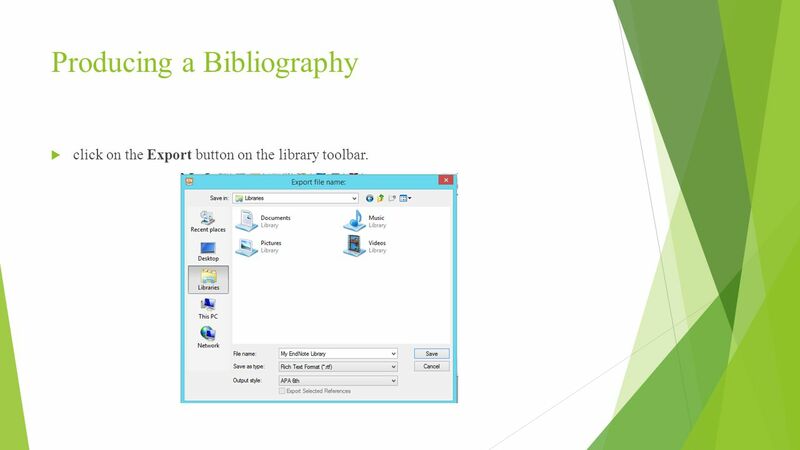 22 Producing a Bibliography  click on the Export button on the library toolbar. 23 Using EndNote with a Word Processor  If you have a compatible version of Microsoft Word (Windows or Macintosh) installed on your computer, the EndNote installation will insert extra files into your word processing software. These files make up the Cite While You Write add-in. 26  In EndNote: - Click once to highlight the reference you want to use. 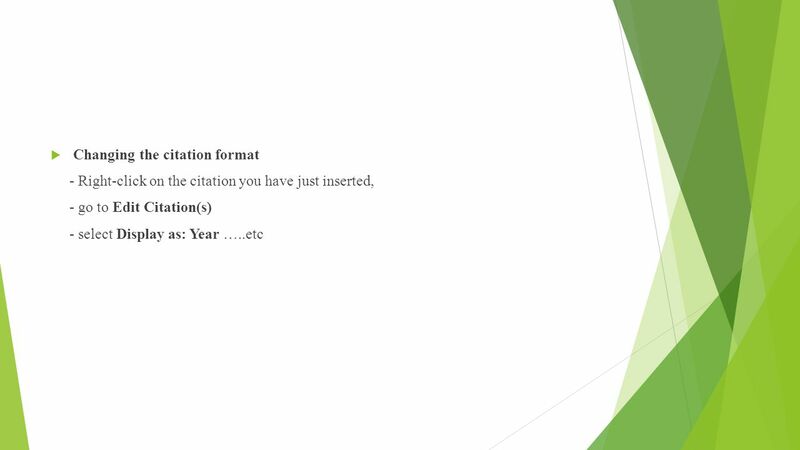 - Click the Insert Citation button. Return to your Word document. You should see a citation. 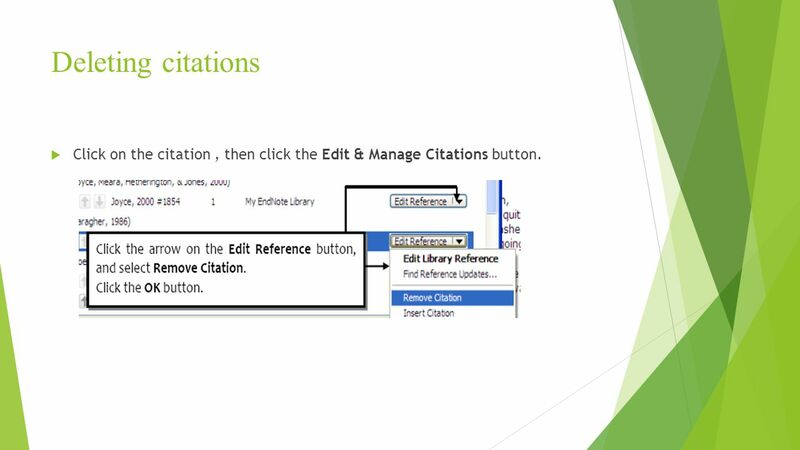 30 Deleting citations  Click on the citation, then click the Edit & Manage Citations button. 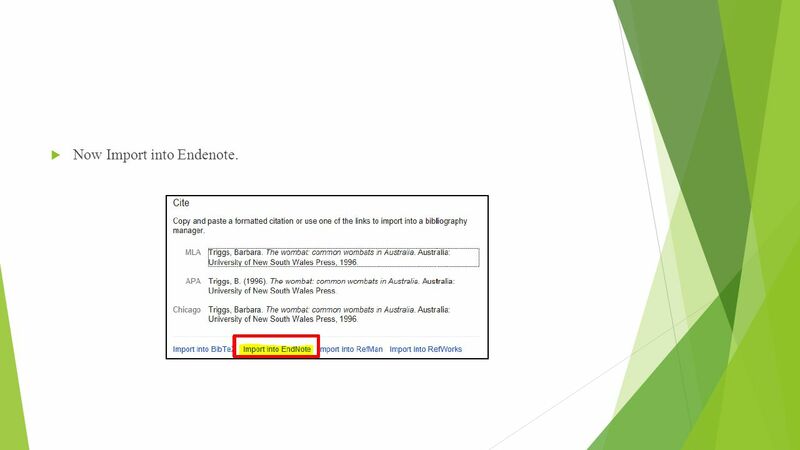 Download ppt "EndNote. 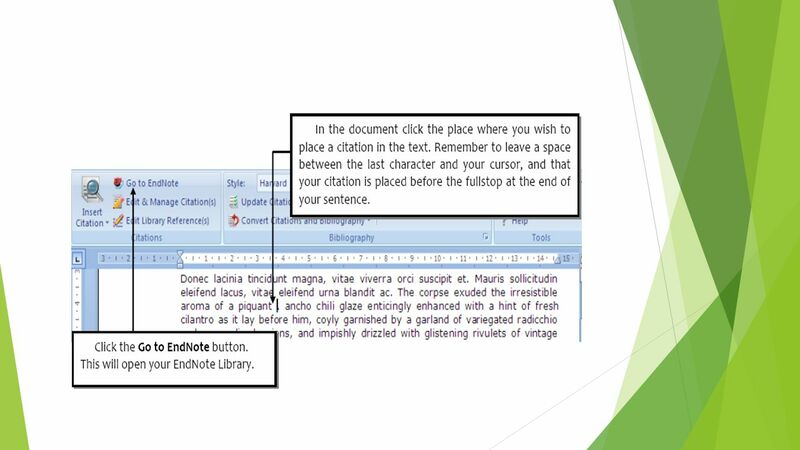 What is EndNote:  EndNote is referencing software that enables you to create a database of references from your readings. Your database of references." In the Format section, we have activated the Bibliographic style drop down menu. From this page, you can choose a specific journal or format (e.g. BMC. 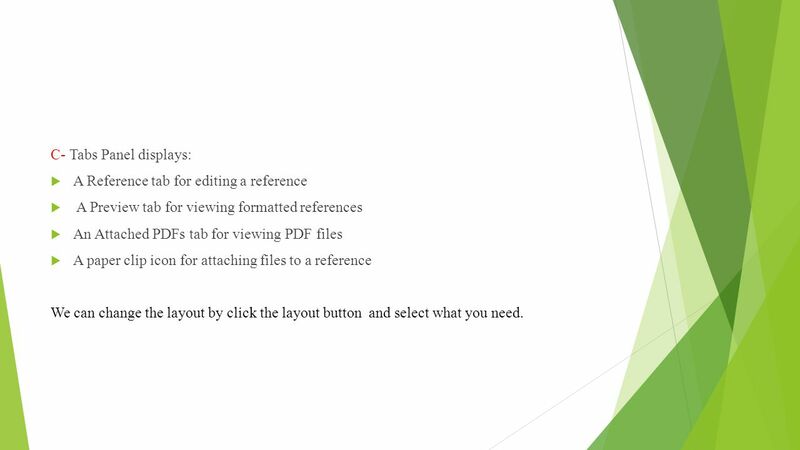 Use Watch folders to automatically add PDFs to Mendeley Desktop. Electronic tools can help find, organize, store, and cite resources Dropbox Evernote Google Tools/Advanced Searching Tips Google Scholar EndNote Easybib. EndNote reference manager. 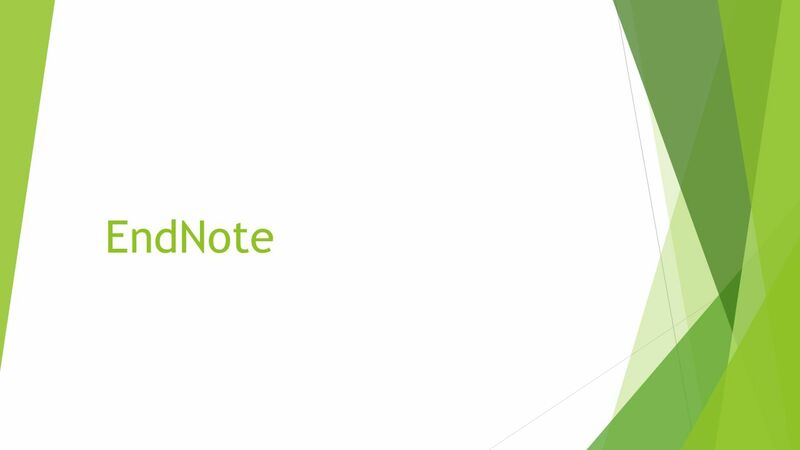 Introduction to EndNote. EndNote X Basics and New Features. 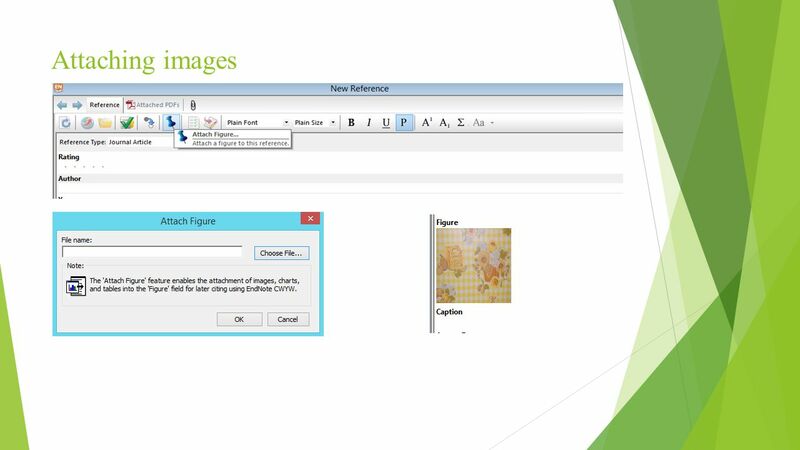 EndNote --for managing papers & bibliographies Construct papers in Word (built-in templates) Construct papers in Word. Endnote X4 Training Managing your References Garry Storer IT Training Co-Ordinator IT Services. Caitlin Brown, LLMSW & Rachel Lathrop, LMSW Wayne State University School of Social Work Center for Social Work Research. NUS Medical / Science Library 1 Basic Workshop. NUS Medical / Science Library 2 Objective To Learn to use EndNote software to manage references and easily. 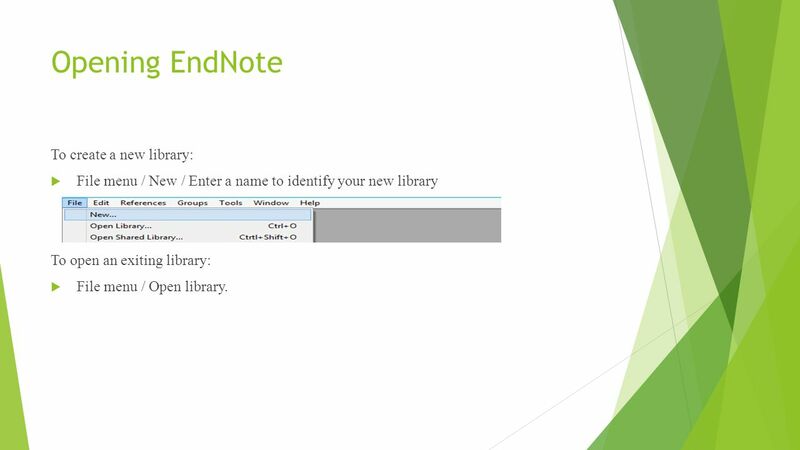 Getting started with ENDNOTE Compiled by Helene van der Sandt. FALL 2011 JACKIE STAPLETON, LIAISON LIBRARIAN MARTHA LAUZON, LIBRARY ASSOCIATE RefWorks: The Basics Introduction to Refworks workshop Pre-learning assessment. Organizing your Research with a citation manager ENDNOTE. INTRODUCTION TO REFWORKS Ben Watson and Anna Miller TEMPLEMAN LIBRARY. KURSUS KEMAHIRAN MAKLUMAT PENGURUSAN BIBLIOGRAFI (ENDNOTE) oleh : Liyana Jasman Pustakawan Perpustakaan Hospital Canselor Tuanku Muhriz, Pusat Perubatan.